Brian Gionta eventually served as captain for every NHL franchise he played for, including the New Jersey Devils, Montreal Canadiens, and Buffalo Sabres. Next month that trend will continue as he leads the 2018 U.S. men's hockey team in Pyeongchang. But when it comes to getting his 12-year-old son Adam to listen to him about the nuances of a game he knows inside and out, Gionta has met his match. 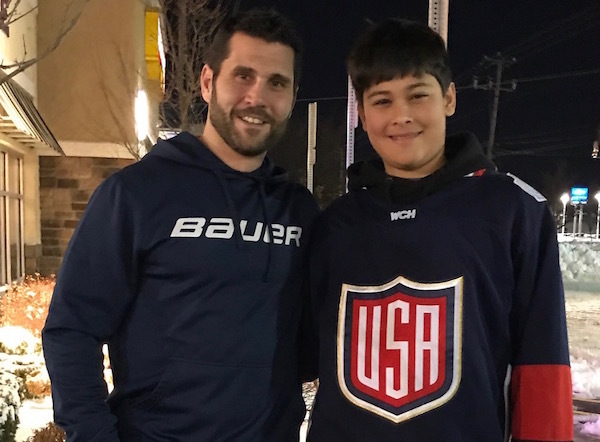 This Kid Reporter had a chance to sit down with Gionta after a day of watching his son play at the Cup North American Championship over MLK Weekend, a top youth hockey tournament. Gionta sits at a cafe in Williamsville, NY—not far from where he grew up (Rochester) and just miles from his home since joining the Buffalo Sabres in 2014. As a product of USA Hockey, Gionta is honored to help Team USA once again. Gionta’s path began the way most American hockey players’ road to stardom does: at cold rinks, cheered on by passionate parents and coaches. Gionta was always among the smallest players on his teams. That meant he always had to prove himself. Drafted 82nd overall by New Jersey in 1998, the 5' 7" winger made coaches, teammates, and opposing players take notice of his competitiveness. The game taught him to work hard and to fight for every opportunity. His hard work helped him lead Boston College as its captain to an NCAA Championship during his senior season in 2000-01. He then played for the Devils for seven seasons before signing with the Canadiens in 2009 and the Sabres in 2014. Because Gionta had not signed with an NHL team by the start of the 2017-18 season, he was named to the 2018 Olympic squad. “With the NHL not involved in the Olympics this year, it’s given me the opportunity to play again,” Gionta said. “It’s a special thing to play for Team USA and I never thought I’d be able to have this chance again." Gomez thinks Team USA will benefit from having Gionta as captain. “There’s no better person to lead that team than Brian,” Gomez said. “He leads by example and all those guys will see and learn from his hard work." The team will compete from February 14-25 as part of Group B, along with Russia, Slovakia, and Slovenia. Unlike at the last Olympics that Gionta played in, this team will be made up of players from college, the minor leagues, and the European pro leagues. Team USA takes on Slovenia on February 14, Slovakia on February 16, and Russia on February 17. Should Gionta’s squad advance to the gold medal game, fans can cheer for Team USA on February 25. Undoubtedly mong those rooting for Team USA and Gionta will be the youth hockey players who see him at games around the Buffalo area, where his son plays. And Gionta has a simple message for those kids, and all kids playing on travel and recreation teams across America who have big dreams of playing on the Olympic stage one day. It’s a lesson he hopes to pass on to the younger players on Team USA. It’s one he even gets through to Adam.